A saleswoman holds up athletic shoes by Reebok and Adidas in Taipei August 4, 2005. A Taiwanese owned company whose parent firm posted a more than half billion dollar profit last year has been refusing to pay compensation in line with an arbitration ruling to hundreds of Cambodian workers it made redundant. Cambodia’s Arbitration Council ruled in late February that Yan and 477 others who had worked at the company for more than two years should have been compensated as permanent employees. 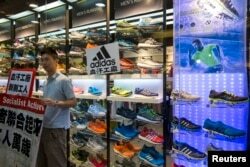 A labor activist stands outside an Adidas store with a protest sign, in support of a strike by workers of Yue Yuen Industrial Holdings, pasted on its shop window during International Labour Day in Hong Kong May 1, 2014. In an emailed response, Chihchien Lin of Pou Chen Group’s legal department, stood by their decision to class the workers as non-permanent employees on fixed duration contracts, noting that all but 50 workers - some 1,900 people - had taken the payments they offered. “PYC sincerely regrets that there are still existing complaints about the termination at factory disclosure due to different interpretation on the laws regarding FDC [fixed duration contracts] and UDC [unspecified duration contracts],” Lin wrote. 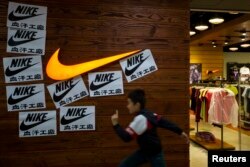 A child runs past protest signs pasted around a Nike logo in support of the strike by workers of Yue Yuen Industrial Holdings in Dongguan, during an International Labour Day rally in Hong Kong May 1, 2014. “If no pressure, those companies would continue exploiting their laborers peacefully although they have [a] clear Code of Conduct to respect workers' rights,” he said in a written response. “I think Amer Spot [sic] should look at the history of AC awards so far, how people take serious about AC decision in such corrupted system in the country and should be responsible for their consumers by stop exploiting their laborers and apply their CSR [corporate social responsibility],” said Moeun Tola. “As the government we provide the compensation to workers, as we don't want them to worry or be frustrated about their payment,” he said. The government, he said, would pursue the foreign investors responsible for the closure or others holding liability to recuperate the sums owed, vowing that “when they come here we’ll take action”. He shouldn’t have to look far, as Pou Yuen is still in Cambodia, according to Amer Sport’s Covatta, who said the firm is building a new, 2,800 worker capacity facility - reflecting his company’s “commitment to provide jobs in Cambodia”. That’s cold comfort for Sor Chanthorn, the 46-year-old president of the Cambodian Alliance of Trade Unions local branch.